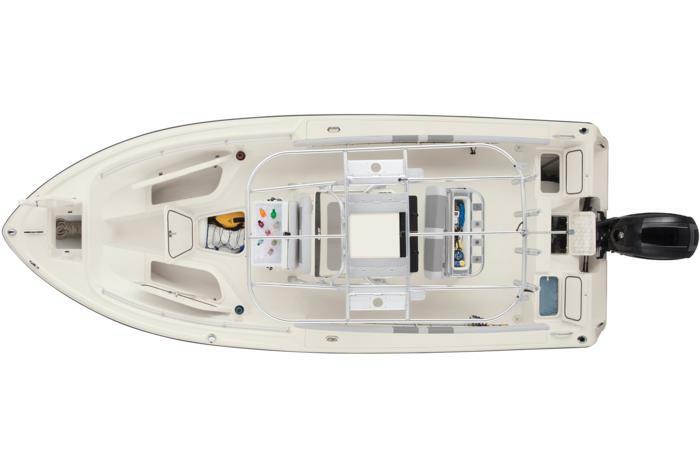 Long enough to get away from the coast, but easily towable, the 214 CC is a pure fishing boat with a hull designed for the sea and a lot of practical equipment. Founded in 1967, the Mako shipyard is not a newcomer. For years, it has been building fishing boats whose reputation is second to none. 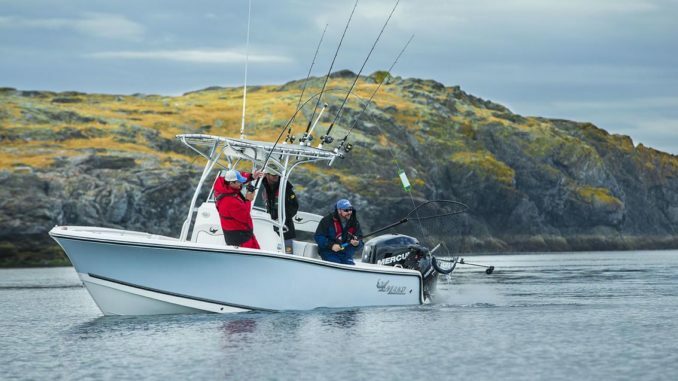 The Mako range is divided between two families; inshore boats, made for sheltered waters and lakes, and Offshores Boats, designed to go fishing offshore. The 214 CC belongs to this second family and even if it is not really long, it was created, built and equipped like its big brothers. 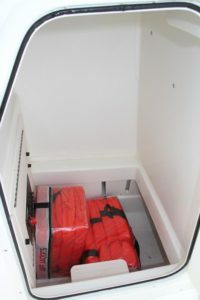 From the outside, you can see that the 214 CC is a real fishing boat with a tight line, a high and protective bow and a deep cockpit to keep the crew safe. The other trademark of the brand is obviously its deep V hull, very well stabilized on the back thanks to large chines and a profile that flattens slightly. The sharpened bow is advantageously assisted by large strakes and the mass distribution gives the ship excellent balance. Another very good point is the construction with a double foamed shell to ensure solidity and safety. The structure of the hull is also guaranteed for life while the entire boat is guaranteed 5 years and the gel coat 3 years, something that is reassuring. When you bring this boat onto the water, the Mako literally erases the chop and there is no noise, vibrations or squeak. For each wave, you can feel that the boat is facing the sea as a block and without spraying water everywhere. But the 214 CC is not only a warrior since it is stable and efficient and able to provide a good level of comfort even in bad conditions. It is also easy to drive without the need for a lot of experience. 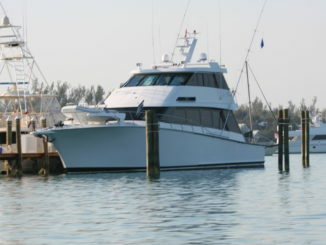 In short, it is an easy and reassuring boat. 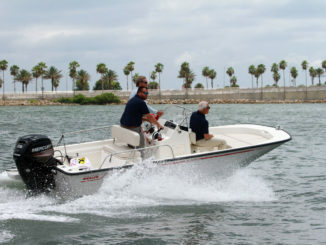 The performance is not outdone as the fishing boat can board up to 250 hp for only 21’5’’ long. For the test, we had the new 150 Pro XS from Mercury, a beautiful engine, silent, responsive and powerful. 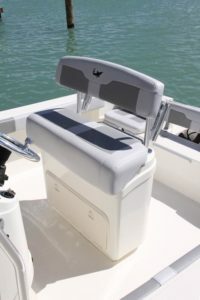 Considering the program of the boat, this engine is more than enough, allowing the boat to plane in a little more than 5 seconds with a maximum speed close to 40 mph. On cruises, we run at 25 mph which already allows for a good trip. For a little more comfort, you can opt for 200 hp, but the maximum power does not really seem necessary. Regarding the layout, the 214 CC is quite traditional with a nice central console around which two spaces are organized. 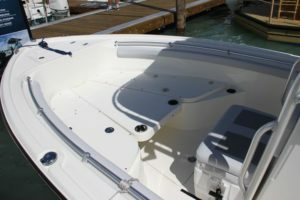 On the bow, two long chests can serve as a seat, but access to the bow is maintained to use the well-designed anchor locker and to fish. The space can receive a central table and be turned into a solarium. A small seat in front of the cockpit completes the space. The console offers all the necessary space for electronics and switches and keeps a voluminous space inside where we can possibly accommodate a toilet. Our only regret is that the leaning-post is a little high and placed a little bit far from the console. 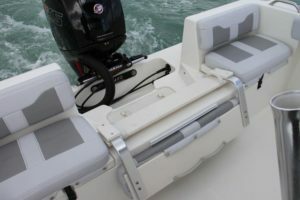 On the rear, the transom accommodates a wide bench whose central part tilts to pull up the engine. In fact, the engineers used most of the space. The pilot seat can be summed up as a simple leaning-post or as a seat with livewell. The facilities dedicated to fishing are not lacking. 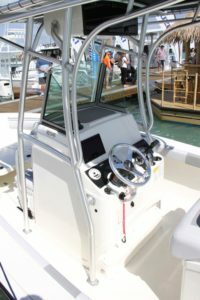 In addition to the high freeboard, there are many supports for fishing rods, handrails everywhere, racks for rods in the flanks and a livewell on the back. 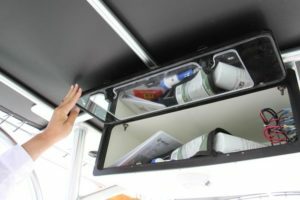 Finally, there are some extras like the mirror in the storage door under the T-top that allows you to see what is inside and the removable leaning-post backrest that offers more support for the fishing rods. As always for this brand, the equipment is quite complete since it includes the T-Top, the custom stainless steel steering wheel, the courtesy lights and many other things. 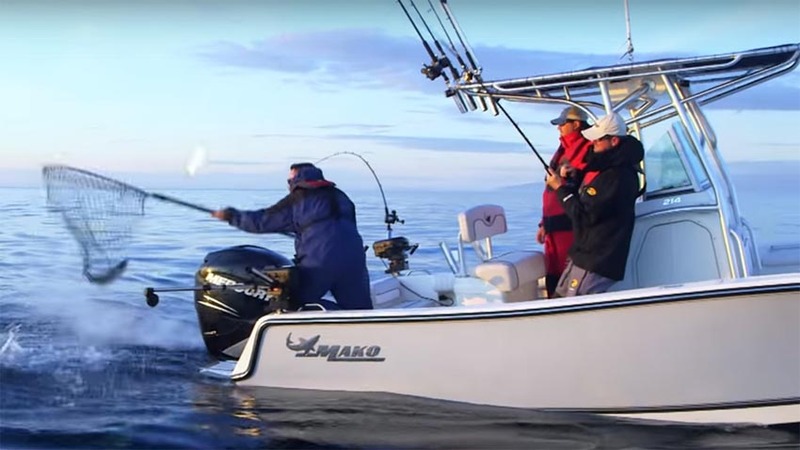 If you are looking for a small sized fishing, but with robust construction and complete equipment, the Mako 214 CC is worth considering. 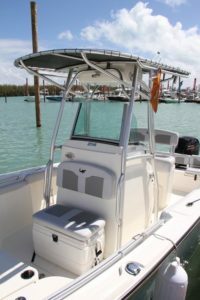 Well designed and good on the sea, it brilliantly perpetuates the traditions of sport fishing boats. 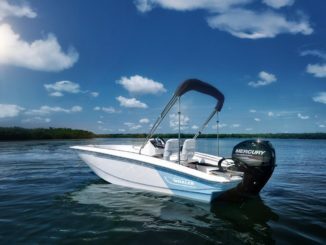 All-New Boston Whaler 130 Super Sport, not so small!